In Japan, the Plant Variety Protection Law has been established to protect new plant varieties. In order to have a new plant variety registered in Japan, it is necessary to register that variety with the Ministry of Agriculture, Forestry and Fisheries (MAFF). After registration, the breeder’s right holder has the exclusive right to use the plant variety professionally (including the cultivation and sale of plants, etc. ), and can circulate the variety in the market under the registered name without obstruction from third parties. If plants or crops etc. of the registered variety are used by another party without permission, this constitutes an infringement of the breeder’s right, and the breeder’s right holder can seek an injunction or payment of damages. It is difficult to categorize plant varieties based solely on their outward appearance, and so identification of a variety is determined by its name. Accordingly, it is that granting a variety registration will enable the appropriate and smooth distribution and use of plants. When a plant variety is registered, it is protected for a period of 25 years from the date of registration (in the case perennial plants such as fruit trees, lumber trees etc. the period of protection is 30 years). 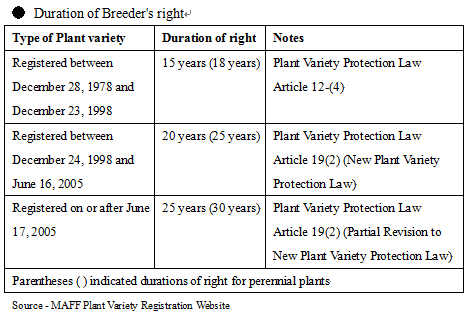 Note: however, depending on the date of registration, the duration of right may differ due to the application of an older Plant Variety Protection Law. Plant variety registration is an important system for protecting valuable plant varieties from imitation and unauthorized use both in Japan and abroad. As with other intellectual property rights, the jurisdiction for plant variety registrations is based on the territorial principle, and registration must be carried out in every country in which protection is desired. A problem in recent years has been an increase in the unauthorized outflow of Japanese plant varieties abroad, especially in East Asian countries. Ultimately, MAFF announced emergency measures for the prevention of outflow of plant varieties etc. abroad, and is currently hoping to promote awareness of the plant variety registration system. Here we would like introduce Japanese examples of trademarks closely associated with plant variety registrations, which we hope will prove to be useful information for readers. Names that have already been registered as plant varieties under the Plant Variety Protection Law cannot, as a rule, also be registered as trademarks with the same scope. When the name of a plant variety has been registered under one of the above two laws, it is thereby excluded from registration under the other. ★Even if the owner of a trademark right applies for registration of the name of a plant variety that is identical or similar to their registered trademark, the plant variety registration application will not be accepted (Plant Variety Protection Law Articles 4(1)(ii) and 4(1)(iii). On the other hand, unlike a trademark right, a plant variety registration does not allow exclusive ‘use of a name’ itself. This is because it is compulsory for all those who convey seeds and saplings as a business to use the names of relevant registered varieties, even if they do not hold breeder’s rights (Plant Variety Protection Law Article 22(1)). Since there is no exclusive use of the name of a plant variety, by promoting use of its name, it is possible for a plant to be smoothly and widely distributed (which is the aim of the Plant Variety Protection Law). ●There is no effect regarding crops from registered varieties and processed goods made using registered varieties as raw materials. As a result, it is said to be difficult to prevent registration of a trademark designating crops or processed goods that has an identical or similar name to a registered plant variety. Also, after the period of protection for a registered variety (25 or 30 years) has passed, anyone is able to use the name of that registered variety. ★Applications by breeder’s right holders for trademarks identical or similar to the name of their held plant variety registration will not be accepted for the period of duration of the plant variety registration (Trademark Law Article 4(1)(xiv)). ★Also, after the period of duration of a plant variety registration has expired, the name of said plant variety becomes a generic name or descriptive mark and registration of said name will not be accepted (Trademark Law Articles 3(1)(i) and 3(1)(iii)). • Under the Trademark Law, it is possible to register the name of a plant variety as a trademark designating goods or services of “seeds”, “seedlings”, “vegetables”, “fruits”, “transport of agricultural goods”, “seedling training”, or other crops/processed goods etc. • Unlike under the Plant Variety Protection Law, exclusive use of a registered trademark regarding designated goods and services is recognized, therefore it is possible to prevent a situation where anyone can use that name (or mark), Thus, those who wish to use the name of a variety on crops or processed goods to increase their appeal should acquire a trademark right. Note: also, acquiring a trademark right will prevent a third party from usurping the right to use the name on processed goods. ● It is not possible to register a trademark with a name that is the same or similar to a registered plant variety. This is not limited only to “other parties” and applications made by the holder of the breeder’s right will also be rejected. ●On the other hand, identical or similar trademarks that designate goods is different classes (crops, processed goods etc.) may be registered. Under the Trademark Law, “seeds”, “seedlings”, “crops” and “processed goods” are not treated as similar to one another. Accordingly, as in (3) below, it is possible that a third party might usurp the right to a name. If so, it will not be possible to use the name regarding the goods/services that the usurped right covers. This may pose a serious problem for breeders, sellers and processors etc. ●Unlike under the Plant Variety Protection Law, once a trademark has been registered, the right will not expire provided that renewal procedures are carried out correctly. ●After a plant variety’s registration period has expired and the plant variety registration has been terminated, the associated name will be treated as a genericname that is generally used as a proper noun. As such, as a rule any subsequent trademark applications will be rejected. • Identical or similar plant variety registrations and trademark registrations are considered duplicate and cannot be registered. • If a plant variety registration already exists, an application for a trademark with the same name and an identical or similar scope of rights will be rejected due to the existence of the plant variety registration. This remains true even if the person applying for the trademark is the owner of the breeder’s right. • Conversely, if a trademark registration with the same name and an identical or similar scope of rights already exists, an application for a plant variety registration will be rejected. In the same way as above, applications will be rejected regardless of whether they are made by the rights holder or others. • When applying for a plant variety registration, it is recommended to carry out a trademark search in advance. • It is especially common for applications to be rejected due to the following types of goods. Therefore it is vital to include these goods in a trademark search. Note: designated goods in a trademark do not specify a particular variety of plant but comprehensively include all plants. Note: conversely, when filing a trademark application in with the above scope, a plant variety registration search should be conducted in advance. Note: an advantage of method A is that it is easy for administrations or farming collectives etc. to advance their brand strategy. If, for example, an improved variety of “Fukuoka S6 Gō” is developed, those strawberries can easily still be sold under the name “Amaō”. Note: the designation of services related to plants such as seedlings is avoided. Why is a plant variety registration alone insufficient? As written above, although a plant variety registration precludes the registration of an identical or similar trademark, a trademark designating crops or processed goods can still be registered. Accordingly, when you decide to process and sell goods produced from the registered variety, the type of goods may be restricted by a third party, in which case even if you are a legitimate breeder’s right holder, you will be unable to use the name of the plant variety on the processed goods. The following is an example of a case in which the breeders suffered a loss due to this kind of situation. A third party restricted use of “Aizu no Kaori” with a similar trademark registration. Why was a third party able to register a trademark similar to the name of the registered plant variety “Aizu no Kaori”? This third party was able to register the trademark as it designated processed goods made from buckwheat. As written above, a trademark identical or similar to the name of a registered plant variety is prevented from designating seeds or seedlings, but not prevented from designating crops or processed goods. In this case, in what way could Fukushima Prefecture sell processed goods? When selling processed goods when restricted by a trademark in this way, the only way the name “Aizu no Kaori” could be used is to indicate it as the name of the variety of buckwheat or the name of an ingredient etc. (for example, written in a list of ingredients on product packaging). • When registering a plant variety, a trademark application should also be considered taking into account crops and processed goods based on that variety. • Even when a trademark has not yet been used on any goods sold, anyone is able to register that trademark, and under the trademark system whoever files an application first will be awarded the right. In order to avoid a third party filing an application first, a trademark application should probably be made before publicly revealing the name of the plant variety. Here we will introduce some examples of plant variety and trademark registrations made regarding famous varieties. “Amaō” is often given as a good example of a plant variety registration and trademark registration used well together. It is a primary factor in the success of the strategic cooperation of Fukuoka Prefecture and “JA Zen-noh Fukuren”, and is a useful reference case. “HARAKENZO more” understand that the development of a new plant variety is the result of the combined efforts of a large number of people, and we know the importance of a plant variety registration in correctly distributing and protecting the rights associated with that variety. Meanwhile, as described above, it is effective to combine a trademark or trademarks with a breeder’s right in order to protect crops and processed goods produced from a plant variety on multiple fronts. “HARAKENZO more” is keen to assist breeders in protecting their intellectual property, and would be delighted to provide you with consultation to answer any inquiries you may have. Also, in MAFF’s emergency measures for the prevention of outflow of plant varieties etc. abroad, HARAKENZO WORLD PATENT & TRADEMARK has been selected as a designated agent and consultation point for plant variety registrations. In order to counter the recent increase in damages caused by the foreign outflow of plant varieties, please consult with our firm regarding an approach to foreign plant variety registration.